Tonight on Bar Rescue, Jon Taffer and crew are headed to Las Vegas to makeover The Hammer Bar. The bar is dealing with a strained friendship between two trained chefs, Chris and Mitch, who own and operate the bar. Bar Rescue came to update the bar back in March, and they decided to change the name from The Hammer Bar to Hammer & Ales. "Awesome bar! Watch Bar Rescue in September to see more! Open 24 hours & owners are there all the time to make it a great experience. I highly recommend the APPLE BOTTOM drink that part owner Mitch suggests for the ladies." "Great beer selection - food was better than I remembered"
"Excellent dive bar with shockingly good food. Came here for dinner because the food has good reviews. Was surprised to find a nice, clean dive-style bar with a great atmosphere. Lots of beers on tap. The food was standard pub fare in terms of options, but the quality was exceptionally impressive. The service was excellent. I will definitely come again!" "This place rocks! Came in here about a week ago with a http://restaurant.com certificate. The staff were super friendly and welcoming. Brock is awesome! We were surprised at the awesome beer selection! I expected a dump and was pleasantly surprised with how Home Depot fresh much of the stuff was inside.. Drinks were a great deal ($2 beers, $1.50 sodas) and food is moderately priced but surprisingly good for bar food. The one bartender was very sweet and she worked FAST!" "Dive bar...you betcha. Cafe lights string on the ceiling and their 24 beers... well it seemed like they were out of half of them. Not good for a holiday weekend. No food was being served but we were offered BBQ that was sitting out for an event they just had. Really was expecting more we'll see how much better they are after they go on the air Sept 8th." According to a story on VegasNews, tonight there will be a viewing party of the episode Hammer & Ales as well as a celebration of the start of the football season. That article also stated that business is 'now thriving' at Hammer & Ales. Both owners wrote to Bar Rescue to be on the show as well as a few regulars that go to the bar. Owner Chris Sarret is quoted as saying "Seeing how the bar and the staff transformed into something better made the overall experience well worth everything we went through." Hammer & Ales went from 8 beers on tap to 24 beers on tap, and is open 24 hours a day. Here is a video interview the owners did recently on a Las Vegas news station. It seems like everything is going good so far for Hammer & Ales, and that the owners are happy with the Bar Rescue makeover. The official Bar Rescue update at the end of the show will be added after the show airs. Also, stay tuned for the rest of the updates of bars that have appeared on Bar Rescue on this site. Update from the end of the show: Six weeks after Bar Rescue visited, drink sales were up 30%, and food sales had increased 15%. Also, for the first time in two years, Mitch invited Chris to his house for dinner. 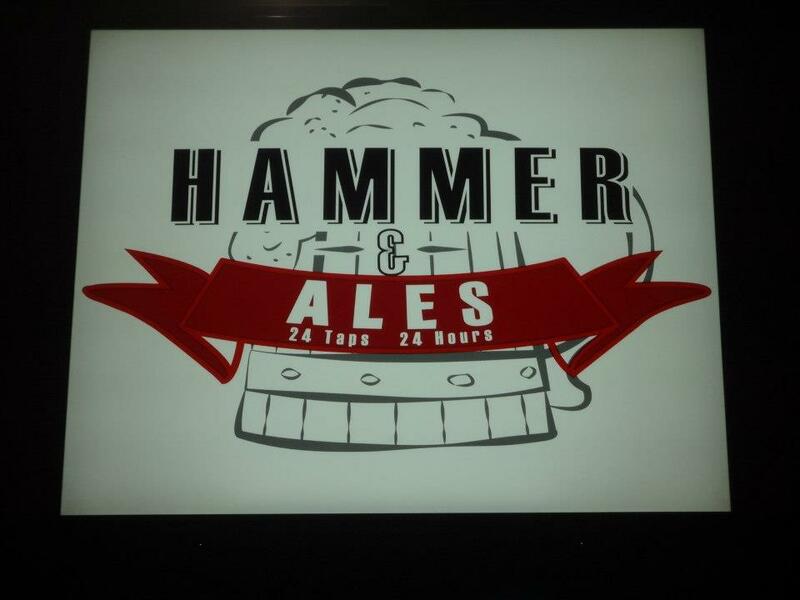 UPDATE - Hammer & Ales closed at the end of March 2016 - More information on the closing. Every time I drive past this place, no matter the time of day, the parking lot is always empty and there doesn't seem to be anyone going near the place. This place has closed down awhile back. This entire episode just seemed "weird"? Weird location, weird partners and weird makeover? I respect the guy for making the right decision to sell his car and pay his debts. This bar will not make it much longer. We went here and everyone sitting at the bar gave you a dirty look like you should not be here. They threw us a menu with none of the beer pairing and all it had on is was just plain ordinary bar food(it was basically a photocopy menu in a plastic sleeve). The owner was sitting at the bar smoking and drinking pretty much like you saw him doing in the episode. Between the crappy menu and the nasty looks...we threw down our menus and went elsewhere. They basically sucked. I don't know you guys. I was out in Las Vegas recently and went there based on the show and loved everythg about it. Super clean place, nice people, and great food. My girlfriend and I stopped in this past Saturday night. It's run down. There were about 8 customers a couple who were clearly drunk. No one even acknowledged that we were there. We left! Went there Tuesday for drinks. Food was cold beer was hot. A hooked came up to us and wanted to go in back room. This is what the bar has come to. Ran out. No tip.